It has been over two years already since we lost you. I think of you all of the time. I promise you will never be forgotten. Rest in peace my friend. I will see you again one day. Never forgotten. Always honored. Always missed. On behalf of my family, I extend our sincerest condolences on the grievous loss you suffered when Chad was killed. 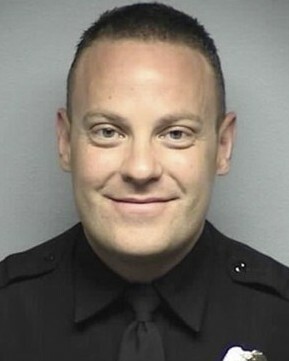 To the Parque family, fellow officers, and all who call Chad beloved , my heart goes out to all of you and may you find comfort in your loved ones and your strength in your faith.This reflection is sent with the utmost respect for the dedicated service Detective Parque gave to his community and the citizens of Nevada , and for the supreme sacrifice he and his family made on January 7, 2017. I hope that everyone will find comfort in the scripture Acts 24:15-"And I have hope toward God, which hope these men also look forward to, that there is going to be a resurrection of both the righteous and the unrighteous." Until we see our loved ones again in Paradise on Earth, please accept my condolences. 5 miles in your honor sir. You are not forgotten. On today, the first anniversary of your death I would just like to say thank you for your service and sacrifice for the citizens of North Las Vegas. And to your Family and loved ones, I wish to extend my deepest sympathy. May you Rest In Peace and God watch over and comfort your loved ones. Thank you for giving your life. My sympathy to the friends and family. Whatever our duty, or wherever we serve, we are all brothers and sisters in this most honorable calling. We have lost yet another brother who we must never forget. My deepest sympathy to both his family and his law enforcement family. My thoughts and prayers are with them. May he rest in eternal peace. To the Parque family, fellow officers, and all who call Chad beloved, my heart goes out to all of you and may you find comfort in your loved ones and your strength in your faith. When my son was killed, the entire law enforcement community in our area embraced us in a circle of love and support, and I know you will receive the same support. It makes the unbearable less torturous, and I pray for your solace. I hope that your family knows that a nation mourned for you. This reflection is sent with the utmost respect for the dedicated service Detective Parque gave to his community and the citizens of Nevada, and for the supreme sacrifice he and his family made on January 7, 2017. Thank you for your sacrifice and may you rest in peace. Rest in Peace Sir. Thank you for your service and sacrifice. May your family be comforted during this very difficult time. Detective Parque, all honor to you for your service that never faltered and never failed. My thoughts are with loved ones, friends, and members of the NLPD. My condolences to the children, siblings and especially to his wife Mrs. Parque, may each of you rest in peace knowing that Chad is forever resting in Heaven. God's peace and speed Detective Parque . Thank you for your brave, and dedicated service. RIP Brother. Rest in Peace Brother! We have the watch from here. May God Bless your family and friends. The Albany Police Academy sends its deepest condolences to the Parque family and the North Las Vegas Police Department. Rest in Peace Detective Chad Parque. Our condolences & prayers go out to the family and friends of this fallen hero. Thank you for your service. We will never forget.